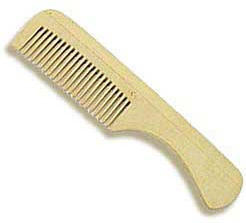 Size (inches): 7.48" X 1.97" X 0.39"
This all wood 7.5" comb fits conveniently into a purse and is constructed with sturdy teeth and a comfortable curved handle. Enjoy the calming and pleasant feel of combing your hair with wood - not plastic or metal. No static electricity and much less chance of hair breakage as the smooth wooden teeth glide through hair. I was looking for a comb with a handle. The only ones i could find were $25 or so.. ridiculous! so I kept looking till i came across the wooden ones at a reasonable price BUT this type of comb doesn't hold a candle to a good old fashion plastic one. It is clumsy to use, the teeth feel like they don't want to comb through or that they will start to chip soon. It is not a pleasant experience. I bought 4 of them and threw them out almost immediately. I do not recommend this comb at all. Since than i found some decent plastic ones made by goody and now i am much happier. More Photographs - Wooden Hair Comb with Handle - 7.5"
End of More Photographs - Wooden Hair Comb with Handle - 7.5"